Brit journalist Alex Bellos has worked in Brazil for several years, and he writes a fascinating account of the "state of football" in Brazilian life and culture. Rather than going into a results-oriented details, his chapters recount major aspects of soccer in Brazil, along with his perceptions of Brazilian culture and mannerisms. In that sense, it has a more sociological perspective rather than sports journalism approach. The book starts with a odd chapter, but somewhat very fitting: He follows some Brazilian players into "exile", playing in the Faeroe Islands. He continues with accounts of the fateful final (1950), the current disgraceful state of the leagues and federation, and includes with a nice interview with Socrates. Among the most entertaining chapters is the "Big Kickabout" (Peladao), the massive football tournament/beauty queen pageant in the Amazonian city of Manaus. 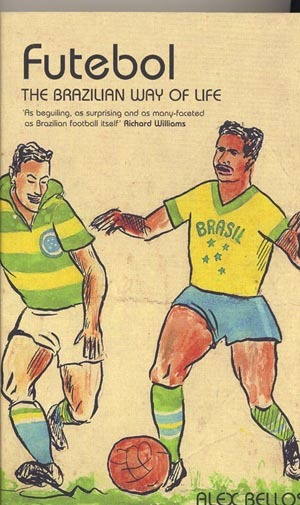 The main weakness of the book is perhaps that there is not enough about the main heroes of Brazilian football. While this is understandable given the nature of the book, it does seem lacking in some aspects. For example, Pele is mainly handled in the chapter whose focus is in fact Garrincha. Again, the goal of the book is not to be mini-biographies of famous players and teams, but it might have been useful and would have added something.